Omaha, Nebr. 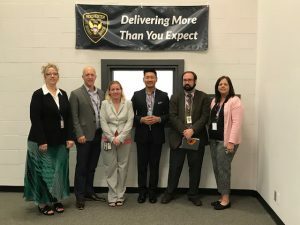 – In mid-August, Rochester had the opportunity to showcase its Cash Vault Services program with the Cash Product Office of the Federal Reserve. Kimberly Allen, Federal Reserve Program Manager; Turner Angell, Federal Reserve CPO Manager, National Programs; Steve Son, Federal Reserve CPO Vice President, National Operations; and Steffan Ziegler, Federal Reserve CPO Business Analyst, National Operations traveled to Rochester’s corporate offices in Omaha, Nebr. “We are proud of the work we are doing in this area and were happy to have the chance to share what’s helped us grow our program with them,” said Joseph M. Shea, president. In 2012, the Federal Reserve launched an effort to help improve relationships between its cash offices and armored car carriers. Rochester has been involved since then, periodically meeting with the Federal Reserve to discuss key issues like business continuity, best practices/compliance, and how to forge close relationships with the banking industry and all members of the cash supply chain. Shea explained that by making the time to build this relationship with the Federal Reserve, Rochester is able to share its approach in this area and better understand the Federal Reserve’s approach. Our Cash Vault Services are ultimately designed to help our customers reduce risk, improve efficiencies, and lower costs, he said. He added that any steps the Federal Reserve can offer to enhance this area is certainly welcomed. “We are honored to be part of such an effort and happily share our thoughts on how to make our company, and the industry safer, more efficient, and focused on the customer,” Shea said.